Braun is a brand I love, they always seem to push the boundaries and bring us unique products. Say hello to the Braun Satin Hair 7 with Iontec technology! The packaging is like many of Braun’s other products – sleek, compact and contains information which is to the point so you know exactly what to expect. Inside the outer packaging, the brush is kept in place safely and also comes with batteries too which is great – especially if you’re giving it as a gift! The back part of the brush also has a removable cushion pad which not only helps the brush glide through without snagging your hair but can easily be removed to clean! The IONTEC technology is something unique and completely new to me which is why I’m a fan of Braun – they always bring us wonderful products and push the boundaries further and further! 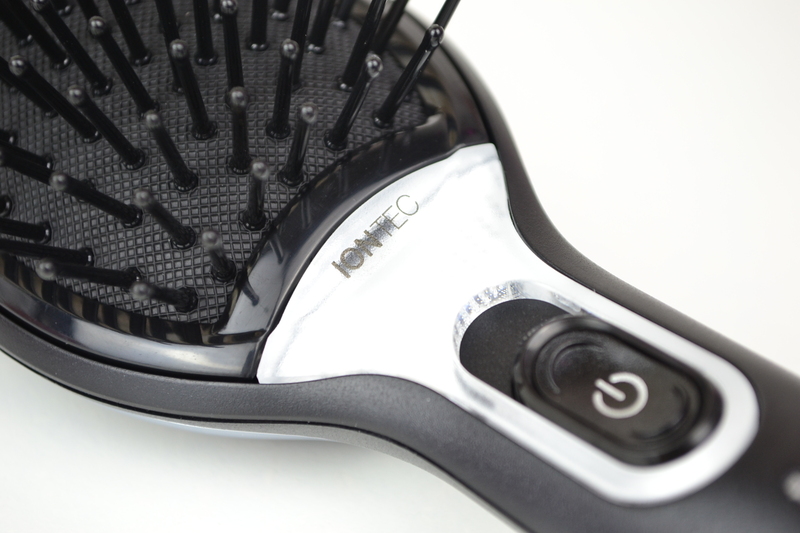 To keep things simple and so you don’t get confused with technical talk, Ions work like a conditioner – when you press the button on the hairbrush (Ion Jet) it releases millions of active Ions that create a ‘halo‘ around your hair to tame frizz and flyaway hairs for touchable smoothness and healthy shine. I have only used this on dry hair and will say that I HAVE noticed a difference as my hair looks a lot shinier and feels smoother to touch compared to when I use a normal hair brush. My hair is getting longer so I am looking after it a lot more and if you’re anything like me you’ll want to add this to your collection. How cute is the green light-up button too – such a geek….I love things like this haha! Wow really liked the review! But just one thing was hivering on my mind that till how much time will the resulted hair by this braun satin hair brush 7 will last? Like in a day if we brush once then till how much tym will the effect will b there? Or is it v have 2 regularly brush it in a day..to keep the shine in control? Hi, I am planning to buy this. Do you have an idea how long will this brush last? Or does the ion have an expiry or something :D.
I like that brand but I didn’t see it before. I would like to try. Fantastic post!! I love braun! this hair brush is perfect! It looks very interesting and professional, but I don’t think it would work on my long tangled hair… I need something with fine bristles and a lot of them! 🙂 I wish you a fantastic new year! great review!! its really nice!! Wow! I had no idea this even existed! This sounds great! That’s so cool! I had no idea that a brush could make your hair smoother and shinier. Thanks for the review! Wow, this product sounds amazing! I have long hair an also try very hard to take care of it. Awesome review, thanks for letting us know about it :)) Very happy you did! This brush sounds amazing! I have very thin hair, so it gets soo static and frizzy when i brush it – would be perfect for me. It is such a good price as well! WOW, that babe looks really cool. but do you think its ok for curly hair? Your reviews are always great! Love the way you detail everything with enthusiasm! This is just so handy ! Merry Christmas ! Great pictures! Merry Christmas and all the best! Adorable post! This sounds totally amazing and my frizzy hair definitely needs it!! !